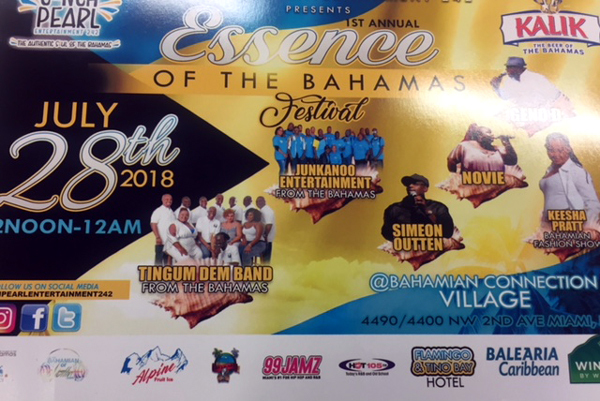 FORT LAUDERDALE, FL - July 19th, 2018 – South Floridians will be able to experience The Islands Of The Bahamas up close and personal when the first Annual, “The Essence of The Bahamas Festival”, brings the culture of The Bahamas to Overtown, Miami, this weekend, Saturday July 28th. World class musical entertainers, Fire Dance, Bahamian Gospel, Bahamian fashions featuring models of ALL SIZES, and jewelry by Bahamian Chevette Williamson – incorporating the indigenous products of The Bahamas, such as coconuts, conch shell, driftwood Poinciana seeds and bay beans - are only a few of the authentic Bahamian experiences on tap for the Essence of The Bahamas Festival. The Festival will bring a conclusion to the month long (July 10th) Bahamas Independence celebrations of the Bahamian diaspora in South Florida. 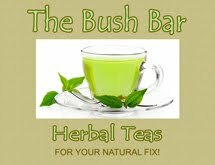 It is a paid event that is open to the public and will take place at the Bahamian Connection Village, 4490/4400 NW 2nd Ave., Miami Florida, 12 noon through 12 pm. 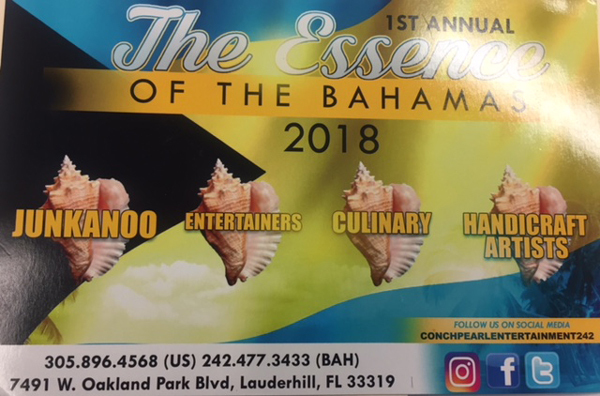 Conch Pearl Entertainment 242, organized the event that is being touted as the most ambitious Bahamian event of its type to take place in South Florida. 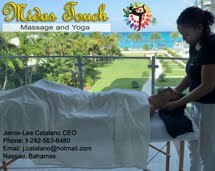 They have said of the event that the name tells it all and, that attendees can fully expect to experience the true “essence - soul” that makes The Islands Of The Bahamas, the destination that it is, with a rich, unique culture that defies imitation.